Istanbul – a city with an amazing history from ancient times. Not only is it a city filled with intrigue and mystery, it is also a city that spans two continents – Europe and Asia. And running through Istanbul is the Bosphorus Strait – a shipping lane that has been the cause of many conflicts throughout history. It is an easy connection between Europe and Asia and, as such, has been coveted by many. Once a year, on July 26, the strait is shut down to all shipping. For this is the day of the great Bosphorus Swim – a trek that takes swimmers from the Black Sea in Asia to the Sea of Marmara in Europe, from one side of Istanbul to the other. All in all, the race is about 6.5 km, or about 4 miles. And it is indeed a race. Swimmers are divided into age categories and provided colored swim caps based on their categories. In all the race should take two hours or less. But the currents can alter that time a lot, either helping or hindering the contestants, even pushing them beyond the finish line on occasion. Anyone who is looking for a swim adventure will find it here. While it is certainly not the longest swim contest, it is certainly one of the most picturesque. In fact, lots of people swim on their backs, so they can view the ancient Ottoman castles and Medieval fortresses along the way. If you plan on participating, good for you – it will be an experience you won’t ever forget. And to make it just a bit easier, here are 10 tips that should help. The race is sponsored by the Turkish Olympic Committee, and if you plan to participate, you must apply in December of the previous year for a spot in the race. Over 2,000 people from all over the world participate. If you should miss the deadline, you can throw your name in a lottery selection which is held in the spring. There are also international swim organizations that are given a certain number of tickets and you can go through them for some great package deals that include hotel stay, contest registration, and other navigational issues. You should have open water experience before attempting this race, and that experience should include a variety of open water swimming, not just large lakes. Gulf, sea and ocean swimming backgrounds are highly recommended, so that you are acclimated to that “open” environment. It is far different than swimming pools and small lakes where you are far more in control of your environment. Currents in the strait are unpredictable and based on overall weather conditions on the day of the race. If you have had solid experience in open water environments with diverse currents, you will probably be fine. 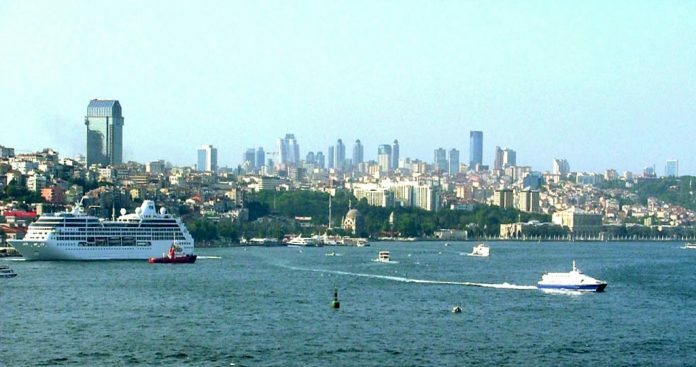 The Strait has numerous curves as it winds through Istanbul. You need to keep a sharp eye out for these, so that you do not end up too close to shore as you swim. Do not forget that you must wear your colored cap and the ankle GPS locator. You can be disqualified if you fail to sport these two items, even if you finish in the top of your category. All contestants may take a boat tour the day before the race. Do this. It will take you to the start point and bring you through the entire course, and there will be tips given along the way. It will be important that you see the race course ahead of time. Water temperatures can vary from year to year. One of the best pieces of advice, and this coming from Pippa Middleton and her brother James, who raced in 2014, is to get into the strait the day before and acclimatize yourself to the temperature and conditions. You will know better what you are in for and won’t hit the water in shock. Stay in the middle of the strait throughout the entire course. If you get too close to either shore, the back currents will stall you and you will have to work hard to get out of them and re-join the race. You will lose precious time if you get caught in a back current. There is a two-hour time limit on this race. Once two hours have elapsed, boats will begin to pull swimmers out of the water. They will usually allow those who are very close to the finish line to complete the race, but if you are a ways back, plan to be picked up. Set your sights on just finishing under the two-hour time limit, rather than achieving a “place” among the winners, especially if this is your first time. There will be other years, and your experience will serve you well. And one last piece of advice. Don’t plan on getting a competitive edge by swimming this course ahead of time. It is illegal for anyone to swim in the Strait except on the one day of the race. While you won’t do any jail time, you will be fined by a Turkish court and eliminated from the race. Follow the rules.